You walk into work, sit down at your desk, log into your email and there it is. A flooded inbox of new assignments, spam, leftover emails from last week, more spam (how did they get my email address! ), and the memo that the third-floor copier is jammed again. Your already serious case of the Mondays just got worse. If you have a physical or emotional reaction to this email overload, you’re not alone. Our state of body and mind is controlled by our sensitivity to stimulants. Our hormones and neurotransmitters respond to these stimulants sending chemicals through our muscles. When you open your email and you get that overwhelming and tense feeling it’s because your brain is being overstimulated by the amount of information being absorbed at once. Getting in a clean car, working at an organized desk or opening a clear email account feels good because our minds are at ease. Maybe you already have a system to organizing your inbox. You star the important ones, flag the ones you’ll get back to and the ones that don’t matter sit unread. Allowing emails to build up and constantly alert you of their presence every time you near your smartphone or log into your email can have a serious effect on your brain. A London based study has proven that “the relentless influx of emails” does more damage to your brain than smoking marijuana or losing a night of sleep. The more activity our brain sees the more glucose is used; we turn glucose into energy to power us through the day. People who work in offices have twice as many distractions in an hour than a person who does not. Each distraction causes us to work less effectively by consuming more of our glucose than we would normally. So while you may think you have avoided the distraction of dealing with your emails by flagging or starring them, they still are heavily weighing on your brain and effecting your performance. Boom! Done, don’t ever have to look at it again. If you know you don’t need it save time and get rid of it now. Let somebody else take care of it. Having everything in one folder that can be handed off to someone else saves you the time searching for it or the embarrassment of not being able to find it when it’s time to be passed on. Not all emails require a response. The ones that are followed by action on your part should go in the appropriate folder. If it requires further communication by you, it goes here. Take care of it later. Sorting through items you can put off makes you more conscious of your priorities. Get ‘er Done! Here’s your task list without having to pull out the old yellow note pad. Now that you have a time and place for everything your inbox becomes a time management tool and stress reliever. Wouldn’t it be nice to make the one thing that drives us the most crazy be our biggest help? Give your neurotransmitters a rest, reduce your stress and sleep easier tonight by trying out the “Delete, Delegate, Respond, Defer, Do” Inbox Zero method. 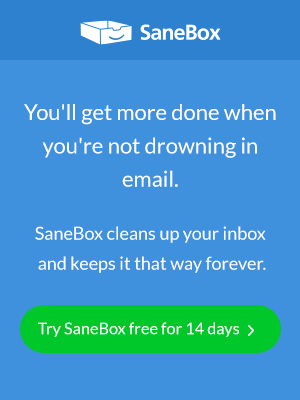 Learn how Sanebox can help you achieve this Inbox Zero method and see what awesome things people have to say about our service! Share your experience on Facebook and follow us on Twitter for frequent updates! Having trouble MOVING the emails to SANEBOX . WHOLE column moves in Gmail. I use inTellimaI’ll. INTELLIMA IL. HOW do I put SANEBOX there? Hi, Shirley—Thanks for reaching out and apologies for the delayed response here. Are you still having issues moving messages? If so, please write us at support@sanebox.com and we’ll help sort things out right away. All the best.